If you’ve read my blog from the beginning you’ll know that I love a self-catering holiday in the UK. 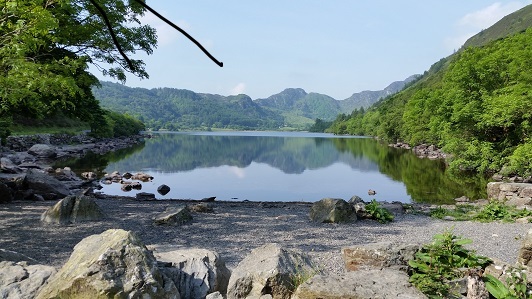 It’s not that I don’t enjoy travelling and seeing the world but I do like to pack up the car and set off with my partner and dogs for a week away from it all in a beautiful and peaceful part of the country. Last year we spent a week in Northumberland; this year it was North Wales. We holidayed in Anglesey throughout my childhood so I have a lot of affection for this part of the world. In recent years we’ve stayed on the coast of the Llyn peninsula a couple of times but this year was the first time that we’ve stayed more inland. 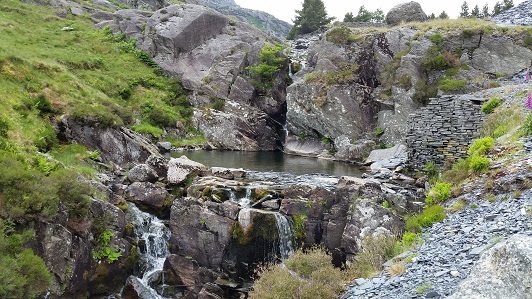 We rented a cottage from Ffestiniog Holiday Cottages in a small village called Tanygrisiau near Blaenau Ffestiniog in Snowdonia and it was perfect. The cottage was really comfortable and welcoming, the weather hot and sunny and the location perfect for days out on the coast or beautiful walks from our front door and further afield. I cook a lot when we’re away because I enjoy it and with two dogs it works better to do our eating out during the day when we can sit in pub gardens with them. I do tend to keep holiday cooking fairly simple because you’re in an unfamiliar kitchen and don’t have your usual store cupboard to hand. One of our favourite holiday meals (which we also eat a lot at home during the summer) is what we call our Mediterranean medley. Firstly, Ainsley Harriott Cous Cous in the spice sensation variety. This is a really good product. All you need to make it is a kettle and a way to measure the water – either a jug or scales (1 ml water weighs 1 gram). It takes 5 minutes to make and serves 2. Finally, I usually buy a tub of supermarket tzatziki which I like but you can easily make your own with a bit of garlic, grated cucumber and natural yoghurt if you prefer. 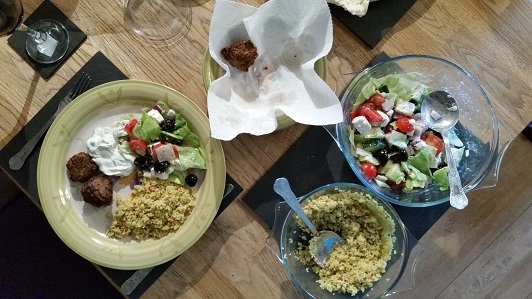 Alongside the cous cous, felafel and tzatziki, I make a simple Greek salad. On this occasion it was a mixture of chopped iceberg lettuce, red onion, cucumber, a bit of red pepper, halved cherry tomatoes, cubed feta and black olives, but that’s flexible. For me it has to have the feta, olives, cucumber and tomatoes to be a Greek salad but your salad can contain anything you like! I dressed it with a bit of olive oil, red wine vinegar and a sprinkle of dried oregano and black pepper. The olives I used are worth a mention because they’re particularly good for travelling. They were Crespo Olives du Marche, Pitted Dry Black Olives with Herbs and they come in a sachet so no concerns about breakages or leaking jars. They’re also really tasty. Oh my, that sounds delish! And Easy (my favorite)! Thanks for sharing!